Our company is ranked amongst the reputed names in the market for providing an extensive collection of Silver Coated Four Glass With Tray. In addition, we offer this range to our customers at affordable prices. The tray is designed in a capsule shape which is very much attractive and unique, it has a set of 4 disco glasses. The Capsule Tray with 4 Disco Glass Set tray and glasses are developed using high quality raw material, these articles are appreciated for unique look and fine finish. 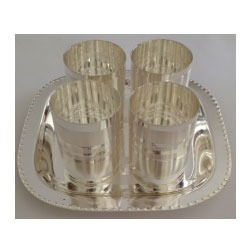 We have a huge collection of silver plated products. These are appreciated for elegant designs & finish. These products make for great gifts. This Product is a high quality, economical and can be used daily as well as you can gift it to your near and dear ones. 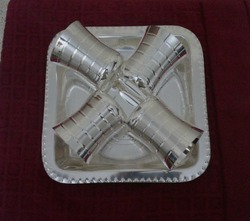 Speciality of this product is that the base material is stainless steel & then silver platting is done.